Can you see four Chilodonella in each of these two pictures? Once thought to be cured easily with .3 salt, these babies survived salt at a .58 level. The distinguishing feature of Chilodonella is the way it changes shapes. It is almost heart shape and the body changes from heart to almost round to oval shape as you watch them under the microscope. They kind of look like they are running like a mouse in a maze as you watch them closely. The 2 pictures of the four of them were taken back to back only allowing time for me to refocus the camera. One can see how much they moved in just a minute or two while I was refocusing. Picture of chilodonella using microscope and digital camera. 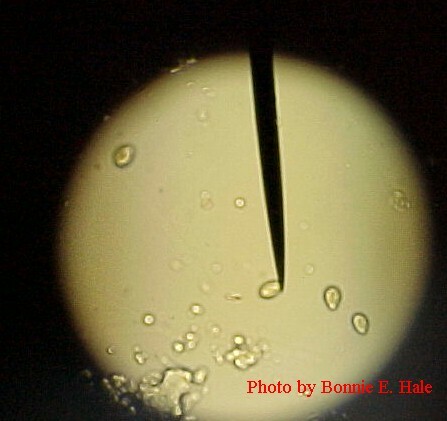 Live video of Chilodonella under a microscope. I know this link works with windows media player but I am not sure if it will work with other video players. 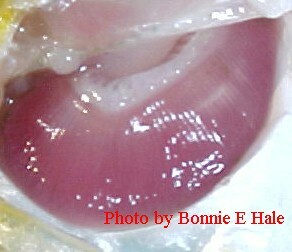 The picture shows gill damage from Chilodonella.